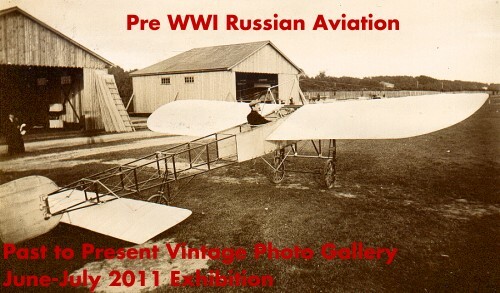 Our June 2011 exhibition presents a rare selection of pre World War I Russian aviation photographs from the archive of Charles Gilbert. Gilbert presented himself as Pilote, Aeronaute et Constructeur (pilot, aeronaut and builder) and was giving exhibition flights with his Aerocycle Rotateur (bicycle attached to a balloon) from the mid 1880's. After several years giving his exhibitions flights in France and Russia, Gilbert moved to Moscow in 1898 where he continues his experiments with lighter than air flight and becomes an instructor at Polytechnic Institute in Moscow. Gilbert came back to France during WWI before the Russian Revolution of October 1917 and it's most likely that he assembled his photo archive in very basic paper books after returning to France. We chose to remove the photographs from the books a few years ago to store the photographs in archival sleeves. Researching early russian aviation was not an easy task. Gilbert's annotations were incomplete and contained errors. Online information in English or French is also very limited so we used automated translation to look for information in Russian and Polish websites. Any comment/correction about this exhibition are welcome. The subjects we plan to showcase next are Protestantism CDVs, World War II Japanese propaganda photos and the Rif War.